Yesterday, I shared an article on Facebook and Twitter that challenged everyone with "how many 80s teen movie have you seen?" The list contained 100 movies and quite frankly, my score wasn't that great (33.) I've never claimed to be a movie buff and teen movies were never really my genre. But I do enjoy the popular ones like Breakfast Club and Ferris Bueller's Day Off. Arnold, Stallone, Willis, Norris, Van Damme, Gibson...those aren't just stars of the Expendables movie series but some of the greatest action movie stars of all time. Back in the '80s, they unleashed hell on the bad guys using machine guns, knives, grenades, rocket launchers, and even their bare hands. 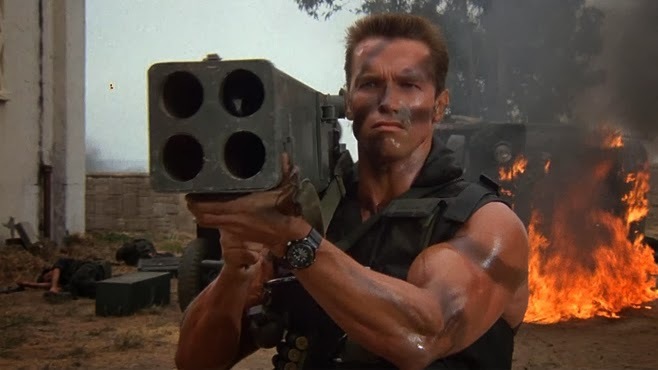 How many of this list of 50 R-rated '80s action movies have you seen? Share your score in the comments below and with your Facebook friends from the List Challenges site. What I need to rediscover: the Death Wish series, a few Chuck Norris and Clint Eastwood movies that I don't remember watching. My score was 37 on this one. Yeah there were a ton more not rated R. Figured I'd go for the throat first. Nice.Didn't have HBO, but had a neighbor friend who did! 23?! Bah. Chuck Norris killed me. Never really got into his flicks.